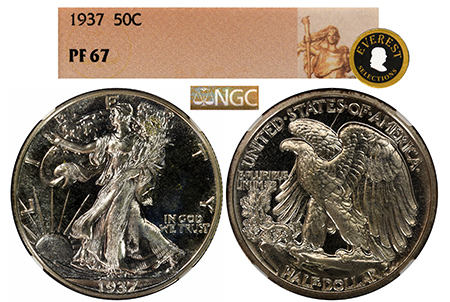 A superb, brilliant 1937 with none of the ugly toning typical for this year! A bare hint of haze that goes virtually unseen, the spectacular condition of this coin is EXTREMELY rare!!! Haze and toning are the two major culprits for this year that prevent the majority of 1937 Walkers from coming out as a highly attractive Proof! Not only is it missing the truckload of haze, but also the obverse and reverse feature clean fields with no spots or visible hairlines. 1 of only 228 examples graded with NONE graded in PF 69, this rare jewel boasts conditional quality and eye-appeal that is very, very difficult to match for this year. You simply don’t find this kind of fully brilliant eye-appeal often!!!!!! !